Hibakusha in front of the Hiroshima A bomb dome. This article was first published on openDemocracy 50.50 on 6 August 2015. It is republished here on the 71st anniversary of the Hiroshima bombing in which more than 140,000 people died. After two prototype atomic bombs incinerated Hiroshima and Nagasaki in August 1945, the “Hibakusha” who survived launched an emotional appeal – “Never Again”. Having warned for years about the “hell on earth” they suffered, only to see nuclear armed states continue to develop and deploy further weapons, these Hibakusha are joining with humanitarian campaigners to demand that governments now negotiate a legally binding international treaty to ban and eliminate nuclear weapons. Setsuko was a 13-year old schoolgirl in Hiroshima when a huge fireball incinerated most of her friends and family on 6th August 1945. Nicknamed “Little Boy” by its makers, the uranium bomb that engulfed her city 70 years ago changed the world for all of us. Three days later, on 9th August , the Americans used a different design – a plutonium bomb they called “Fat Man” – to destroy the beautiful city of Nagasaki, renowned for Madam Butterfly and Japan’s oldest Cathedral, with many historic international connections. War is always bloody and cruel. What really shocked people was the massive power of the destruction that just two bombs wreaked. The huge blast, intense flash and heat that killed over 100,000 people instantly, flattening buildings, setting off uncontrollable fires, and leaving many more with terrible injuries and burns. Then news began to leak out about the silent killer – radiation from these new bombs that caused sickness, tumours and cancer, killing tens of thousands more over the next months and years. Unlike previous weapons, the atom bombs produced radioactivity that maimed unborn babies and also seeped into the eggs and sperm of people who were exposed, changing genes and harming the health of future generations. The nuclear age had begun. It was this awe-inducing power that excited some leaders, while making others fearful for the future. The UN General Assembly’s first ever resolution tried to address “the problems raised by the discovery of atomic energy”. Some of the scientists who had contributed to designing and making the first bombs had begged President Harry Truman to demonstrate their power but not use them on people. After seeing the carnage wrought in Hiroshima and Nagasaki, many more scientists joined doctors and women’s organisations to argue for all nuclear weapons to be banned. They wanted to prevent more being built, and called for stringent controls on nuclear technologies to ensure that no-one would ever use them for weapons again. This fact has caused great pain and disappointment to Hibakusha like Setsuko, “baring our souls with painful memories… to warn people about the hell on earth we experienced in Hiroshima and Nagasaki”. Speaking at the third international conference on the humanitarian impacts of nuclear weapons last December, Setsuko explained that “Through months and years of struggle for survival, rebuilding lives out of the ashes, we Hibakusha… survivors, became convinced that no human being should ever have to repeat our experience of the inhumane, immoral, and cruel atomic bombing, and that our mission is to warn the world about the reality of the nuclear threat and to help people understand”. Her warnings were underscored by information on the many nuclear accidents, miscalculations and near-misses there have been since the 1962 Cuban Missile Crisis, caused by human or technological errors. While we’re encouraged to worry about other nations’ nuclear programmes and support military action to force them to give up, “our” nuclear bombs are called “deterrents”. They are meant to keep us safe. The stock justification is that they have kept “the peace” for 70 years. That’s not a convincing argument or timescale. Our history is littered with disasters that ensued because leaders chose to put their faith in certain weapons or rituals that were meant to deter enemies or ward off evil, rather than taking sensible preventive measures. Calling a nuclear weapon “our deterrent” does not make it so. The weight of evidence and experience point to the opposite. They are not imbued with magical properties. From George W. Bush and Tony Blair to Vladimir Putin and Kim Jong-un, nuclear-armed delusions of power and deterrence have led to reckless military actions, dangerous political posturing and nuclear sabre-rattling, with unintended consequences. At some point our luck will run out. For many, the humanitarian costs of the nuclear age have already been unacceptably high. Several generations have grown up in the shadow of nuclear nightmares, while our governments poured money into modernising weapons rather than pursuing disarmament. Children cowered under desks in ridiculously misleading nuclear drills at school, while nuclear weapons have continued to be driven along our roads and flown above our heads. People in countries without nuclear possession have borne the toxic brunt and long term harm to their health and home environments of the wider nuclear chain, from uranium mining to nuclear testing. Nuclear weapons production requires large militarised infrastructures, investment and secrecy. Human rights have been violated to protect nuclear secrets and hide mistakes and accidents. Their own citizens suffered as nuclear dependant states have disproportionately militarised their economies, putting them at the forefront of arms production and sales around the world. Separately or together, the nine nuclear-armed countries have driven, fuelled and contributed to most of the wars, invasions, ‘proxy wars’ and instability that have afflicted the world since 1945. Noting that “humanity and nuclear weapons cannot coexist indefinitely,” Setsuko asked in Vienna “How much longer can we allow the Nuclear Weapon States to continue threatening all life on earth?” Supported by the Hibakusha, the International Campaign to Abolish Nuclear Weapons (ICAN) the Red Cross and many others are now taking forward strategies that highlight the rights and responsibilities of nuclear free nations to take the lead on negotiating a nuclear ban treaty to add to international humanitarian law. In May 2015, as 159 states signed a statement underlining serious concerns about the catastrophic consequences of nuclear weapons, the Non-Proliferation Treaty (NPT) became predictably deadlocked over nuclear rivalries in the Middle East. By the time the NPT Conference was pronounced a failure, as the United States, Britain and Canada vetoed the draft text tabled by the conference president, 107 governments joined Austria and Mexico in endorsing a ground-breaking humanitarian pledge to fill the legal gap (and negotiate) as the next step. As of today, 113 are now on board. Hiroshima’s Mayor, Kazumi Matsui, this year appealed to President Obama and other policymakers to visit “the A-bombed cities, hear the Hibakusha with your own ears, and encounter the reality of the atomic bombings. 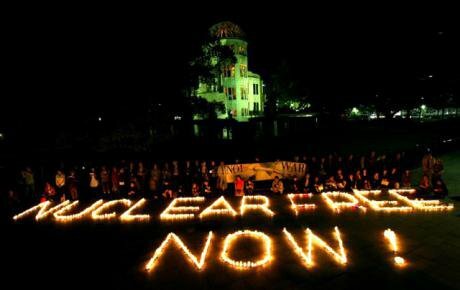 Surely, you will be impelled to start discussing a legal framework, including a nuclear weapons convention.” Setsuko and many others are calling for leadership from the majority of non-nuclear countries to start “negotiations on a ban treaty… to prohibit and eliminate nuclear weapons”. Recognising that Hiroshima and Nagasaki may have created a taboo against nuclear use, Hand Blix demanded “that the taboo be made legally binding”, and “become an international priority”. Drawing from recent experience with other treaties where weapons possessors have resisted legal constraints, Dr Blix understood the importance of pursuing such treaties, which change states’ behaviour because they “serve as a constant reminder of what is expected of them”. For these few days in August, even mainstream media talk about nuclear weapons. But sentimental expressions of sympathy are not enough. As Setsuko told me when we met in Dublin and Vienna, Hibakusha want us to learn from their suffering and take action to make it impossible for anyone else to suffer from nuclear weapons. That means pursuing a genuine process to achieve a treaty that will prohibit the use, deployment, manufacture, acquisition, stockpiling, proliferation and transfers of nuclear weapons and require their complete elimination. Setsuko said she couldn’t understand why British people were allowing our government to spend £100 billion to replace Trident. What is it for? This 70th anniversary is surely time to move on from Trident - time to stop proliferating and start banning all nuclear weapons.